Published April 1998; The MIT Press. 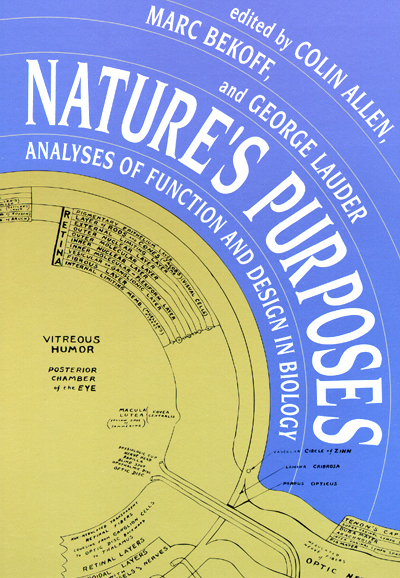 The proper analysis of teleological notions such as purpose, function, design, and adaptation is controversial among biologists and philosophers of biology and has generated a substantial literature, particularly in the past 10-15 years. Interdisciplinary access to this literature is, however, less than ideal. Philosophers and biologists are not always aware of important work in the other discipline, and even among biologists there is sometimes little contact between those whose interests are in functional or comparative morphology, anatomy, and physiology, on the one hand, or in ethology and behavioral ecology on the other. Our aim with this volume is to bring seminal papers in these areas together into one convenient location. Although several of the papers intended for inclusion in this volume appeared in major journals, these journals are not always read or searched outside the respective disciplines or subdisciplines. Several of the papers appeared as invited chapters in books that would not have a broad readership outside a subdiscipline. And these papers have not, yet, been widely anthologized. There is no anthology dedicated to this topic alone, and perhaps the most respected general anthology in the philosophy of biology (Sober 1984/1993) contains no recent papers on this topic. See draft of introduction (© by the editors, all rights reserved).